(Canada) – Partisans and Decimal collaborate to launch new lighting product at IDS Toronto. 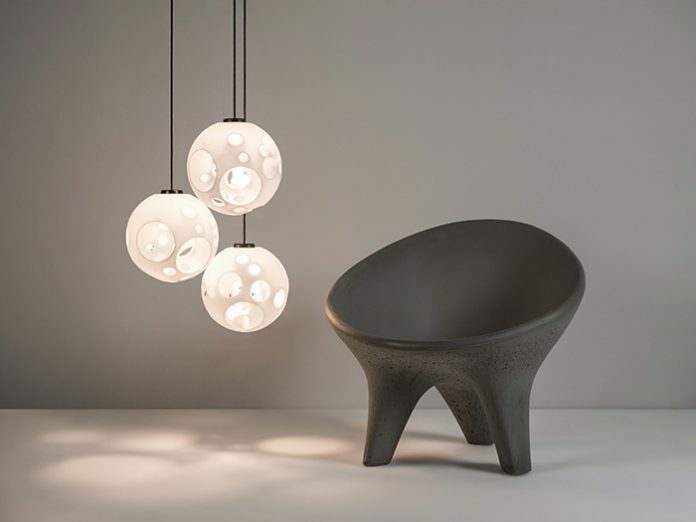 Toronto-based architecture and design firm Partisans has partnered with global 3D-printed lighting platform Decimal to create MoonLight (.015), a new lighting product that made its debut at IDS Toronto. In designing MoonLight, Partisans explored the formal process of employing bubbles to create voids within a traditional spherical pendant light. The result is a glowing orb reminiscent of a lunar landscape. Each MoonLight features a 3D-printed shade and is illuminated using the latest LED technology, which can emit up to 70,000 hours of warm light. Measuring 12-inches in diameter, the laser sintered polyamide shade, takes on the appearance of sculpted porcelain when lit. MoonLight is available for purchase through Decimal and select Canadian lighting showrooms.